A Professor in the Department of Regional and Urban Planning, University of Ibadan (UI), Professor Babatunde Agbola, has called for sustainable environmental management in Nigeria, stressing that the wellbeing of the people depends on the environment. The Don made this call during the 2014 World Environmental Day celebration and Public Lecture, organised by the Directorate of Environmental Management (DEM). Professor Agbola, who delivered the lecture titled; A Good Master Plan as an Essential Tool for Development of a Beautiful and Healthy Environment, said cleanliness required the collective efforts of all in maintaining a beautiful and healthy environment. He described a beautiful environment as the somewhere that delights the senses, attracts admiration and pleasurably illuminates its surrounding. The Professor, who headed the Planning Team that landscaped FUNAAB, said that to maintain a beautiful environment, a Master Plan was needed, which should be reviewed every ten years. Speaking at the occasion, the Vice-Chancellor, Professor Olusola Oyewole, who was represented by Professor Clement Adeofun, the Dean of College of Environmental Resources Management, said FUNAAB was the first University to establish a full-fledged Department of Environmental Management and Toxicology. He charged the people to be conscious of their environment, bearing in mind that the continued survival of man on the planet depended on the sustainability of the environment. The Director of Environmental Management, Mr. Emmanuel Bankole, expressed his appreciation for the support given to his Directorate by the University Management. He said the World Environmental Day began in 1972 and is celebrated globally on the 5th of June each year, to raise global awareness on the environmental challenges such as climate change, waste management, degradation of natural resources and disasters. He urged the participants to protect their environment by refraining from indiscriminate dumping of refuse and open defecation. 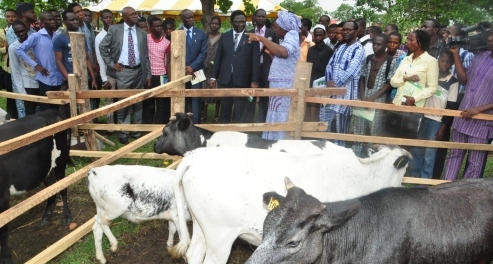 The Chairman of the occasion, Barrister Segun Odubela, Ogun State Commissioner for Education, represented by Barrister Onasanya, showered encomiums on FUNAAB and lauded its efforts at promoting a good environment, saying that Ogun State was always sensitizing the populace on the need to safeguard the environment. Other highlights at the World Environment Day celebration include tree planting and the presentation of plant seedlings to participating schools such as the Federal University of Agriculture International School (FUNIS); Abeokuta Grammar School; Omolaja Shodipo Memorial Anglican School, Abeokuta; Comprehensive High School, Ayetoro; Muslim High School, Abeokuta; and Remo Division High School (Senior and Junior), Sagamu. A Professor in the Department of Regional and Urban Planning, University of Ibadan (UI), Professor Babatunde Agbola, has called for sustainable environmental management in Nigeria, stressing that the wellbeing of the people depends on the environment. 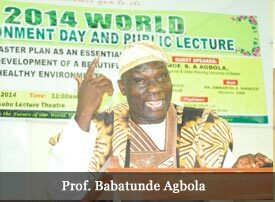 The Don made this call during the 2014 World Environmental Day celebration and Public Lecture, organised by the Directorate of Environmental Management (DEM).Professor Agbola, who delivered the lecture titled; A Good Master Plan as an Essential Tool for Development of a Beautiful and Healthy Environment, said cleanliness required the collective efforts of all in maintaining a beautiful and healthy environment. He described a beautiful environment as the somewhere that delights the senses, attracts admiration and pleasurably illuminates its surrounding. The Professor, who headed the Planning Team that landscaped FUNAAB, said that to maintain a beautiful environment, a Master Plan was needed, which should be reviewed every ten years.Speaking at the occasion, the Vice-Chancellor, Professor Olusola Oyewole, who was represented by Professor Clement Adeofun, the Dean of College of Environmental Resources Management, said FUNAAB was the first University to establish a full-fledged Department of Environmental Management and Toxicology. He charged the people to be conscious of their environment, bearing in mind that the continued survival of man on the planet depended on the sustainability of the environment. The Director of Environmental Management, Mr. Emmanuel Bankole, expressed his appreciation for the support given to his Directorate by the University Management. He said the World Environmental Day began in 1972 and is celebrated globally on the 5th of June each year, to raise global awareness on the environmental challenges such as climate change, waste management, degradation of natural resources and disasters. He urged the participants to protect their environment by refraining from indiscriminate dumping of refuse and open defecation.The Chairman of the occasion, Barrister Segun Odubela, Ogun State Commissioner for Education, represented by Barrister Onasanya, showered encomiums on FUNAAB and lauded its efforts at promoting a good environment, saying that Ogun State was always sensitizing the populace on the need to safeguard the environment. Other highlights at the World Environment Day celebration include tree planting and the presentation of plant seedlings to participating schools such as the Federal University of Agriculture International School (FUNIS); Abeokuta Grammar School; Omolaja Shodipo Memorial Anglican School, Abeokuta; Comprehensive High School, Ayetoro; Muslim High School, Abeokuta; and Remo Division High School (Senior and Junior), Sagamu.